Update status on halt till futher notice,health issue Jan 29 2013. Ok I writing to let yall guys know that currently B.G.M UI related is in halt due to health issue I'm going through. It's started 3 years ago or so when I got hit by Bell's palsy http://en.wikipedia.org/wiki/Bell%27s_palsy ,though at the time I had no real health issue till now nor do I know if i'ts even related. i been feeling constant out of balance and dizzyness(vertigo),this month hit me hard 3 weeks ago,currently I'm trying to get health care programs to do a MRI on brain to see if it's not a tumor etc. So I haven't been feeling great to do much,also When I play games I start to faint abit. I have lump behind my head lower part near my neck. do a go ahead till I get some kind health program or medicaid or medicare etc. For the past 4 years I wake up paralyze can't move at all and I'm self aware,I go back to sleep to sleep it off till I can. I only get paralyze about 2 to 3 times a year,but hears the thing the scary part is that I feel someones hand on my head actually on my front brain and try to smudge me,feels like rapid pulses. It literally feels like some hand on my brain and pushing my whole head down and up rythem motions,luckily it only last maybe 30 secs but I'm still paralyze and can't move. So at the moment i have no will to continue my Ui work,I do play game but offline now for abit and I am temporaly taking medicine called Meclizine 25mg 3 times a day. That only helped me have balance when I walk,before I constantly feel the room spinning and eyes can't stay focus,it always keepts movving from center to right side. I'm giving permision to anyone to continue my work if anyone wants to,I don't when if ever I'm going to work on B.G.M or do a different style UI if I get better later date,right now I don't know. I be uploading a beta unfinished versionof B.G.M purple version 6,this contains all I have worked but some stuff have been broken again from the latest patch and there's no new skin pack to fix it. This can be served as foundation to continue B.G.M for those that want to take it up,skin is still working just some UI skins are no longer used like the travel panel etc. Sorry past days couldn't work on the UI much,been doing little by little. Today I'm working on the instance finder panel,I'm tracking down all the ui image I can find in the pack. I'm leaving Rohan's stuff till last cause I don't have the expansion and I don't know if I can access those warhorse panels yet,for now I'm just fixing and working what I can currently access. After the instance panel I need to work on the expanded deed log page and make new buttons with English letters for Rohan's area. Oct 29 2012,Runekeeprs PIP release patch. Oct 28 2012,by request working on the small runekeeper bars(Buttons). I had a request about 2 or 3 months ago when I release my new fervor bars for champions and hunter to make one for the runekeepers small attunment bars. 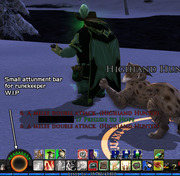 Today I'm working on them,I have to do some cutting due that the small attunment overlaps the attack buttons cause I'm using the images that I created for the hunter fervor bars. It's minor inconvinience for me to do so I'm trying to figure a way that blends bars with the attack buttons so the cut area where I need to do don't look bad. Oct 27 2012,redid the buttons for the annivarsary vitals. Ok I wasn't satisfied how the annivarsary button turn out on my previous post,so I re-did them from scratch and this time turn out better looking. Oct 26 2012 5year vitals 90% done. Phew after so much thought and try and error plus making them from scratch I got it the way should look good for the 5 year annivasary vitals for left and right side. I still need to work on the mini version which I didn't see them till now. In later date I will re-tweak them but for now they look good and not messy(to much). Finish with the normal main vitals,currently working on the signature vitals and fix some problems with it best I can. I have encounter a minor problem with the animation ring but its very minor you most likely wont notice anyways. After I fix the signature vitals I work on the 5 years vitals etc. arc animation is crooked on the circle due to the big outer circle see pic. 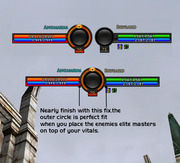 Also align the big circle perfectly to fit on top of you vitals when you place the enemies vitals on top of yours. The regular vitals will be slimmed like your own vitals,only elite masters signature and the anniversary vitals will have the big outer circle's. Oct 22 2012. W.I.P status. Alright track down and fix the following at the moment. Added and re-tweak the image icons for the toolbar that lets you switch bars for horse combat on the main toolbar. Also did this to make the main toolbar more clean and so far I like it this way. The arrows up and down when you mouse over them the second image will popup letting you know so you can press that button arrow to switch toolbar modes(See image posted below). Track down the new code and replace the old code for the who panel and looking for players panel. Finally added the image (Key) for the permission house panel see image below. I still have tons to do please be patience,thanks you for understanding. Edit#2 Oct 22 2012 5:07am ct. Started to work on the vitals,I have fixed the minor white circle bottom of the avatar pic by making the glass button smaller see pic. Also I had to make the box thats located on the level numbers abit larger or fatter see pic as well.